A Knötel print depicting Frederick II the Great during the Seven Years’ War. In 1825, the Prussian cavalry’s regulations emphasized the total elevation of the horse’s head and neck. The experiment lasted several decades, then was abandoned completely. The theory behind the technique was that total elevation of the neck was enhancing the horse’s balance, developing the back muscles, and engaging the hind legs. By contrast, the Prussian Emperor’s Riding Maste, lowered and over-flexed his horses’ necks completely. Paul Splinzner (1853-1920), in fact created the “rollkur”. His theory was that such over-flexion of the neck was enhancing the horse’s balance, developing the back muscles, and engaging the hind legs. Almost contemporarily and on the other side of the Rhine River, Francois Baucher (1776-1873) promoted in his “dernier enseignements” the systematic elevation of the neck. His view was that such elevation of the neck was enhancing the horse’s balance, developing the back muscles, and engaging the hind legs. Half a century later, Jack Licart (1951) reinvented the lowering of the neck. His theory was that the lowering of the neck was enhancing the horse’s balance, developing the back muscles, and engaging the hind legs. Not long ago, Harry Bolt (1973) warned against the practice of over-flexing the neck. The red line illustrates the funicular element of the nuchal ligament. The orange lines illustrate the lamellar elements. In this picture we coloured in red the vertebrae gaining mobility when the neck is lowered, and in blue the vertebrae losing or not gaining mobility when the neck is lowered. Obviously, the relationship between neck posture and vertebral column’s mechanism is more a matter of opinion than scientific documentation. Twenty five thousand, seven hundred and thirty six opinions later, the question: “what does the Rollkur do to horses,” remains unanswered. Olympic riders are winning practicing this technique and therefore anyone anxious to win feels that over-flexing the horse’s neck is the price of winning. In terms of “drowning the fish”, the “Rollkur” largely surpasses any political lobbying. “Is the Rollkur damaging for horses?” is a subjective question. Technology has not been developed to measure the horse’s level of pain. Furthermore, paraphrasing the words of Roy R. Pool DVM PhD, scientific studies often reflect the particular bias or specific angle of the proponents’ investigative technique. Rollkur opponents care for horses. Rollkur proponents care more for success. Everyone would profit to know if there is a physical advantage to work a horse with the neck lowered and over-flexed. Today no-one can win without over-flexing the horse’s neck completely. Scientific references have often been used to support a specific point, but never has actual scientific knowledge been compiled to look at the overall picture. One must begin with the neck muscles and ligaments and follow the effects on the horse’s vertebral column and hind and front legs. Such analysis is the topic of this discussion. The middle of a bounce; an energetic horse takes off with the forelegs before the hind legs touch the ground. This work is executed by the most powerful extrinsic thoracic limbs muscles. Respectively in 1999, 2002, and 2005, three pertinent studies were published. They investigate neck, base of the neck, and back structures that are placed under strain in the rollkur situation. Interestingly, the three studies have been carefully ignored during this whole controversy. Probably the publications were too pertinent and too explicit. The studies explain, in the light of actual knowledge of the equine physiology, how the structures involved in flexion and over-flexion of the neck are reacting under stress. One study investigates the elegant structure referred to as the nuchal ligament, which stretches from the tip of the dorsal spinous processes to the skull. “The equine nuchal ligament. Part 1: Structural and material properties. Part 2: Passive dynamic energy exchange in locomotion.”( K. S. Gellman, J. E. A. Bertram, 2002). The next study measures the gains and loses in vertebral mobility when the neck is lowered: “Spinal biomechanics and functional anatomy,” (Jean Marie D. Denoix, DVM, PhD,1999). This picture shows the superficial neck muscles. Dorsal or upper neck muscles are situated above the cervical vertebrae. Ventral or lower neck muscles are situated below the cervical vertebral linkage. In the mid fifties, Jack Licart referred to the lowering of the neck as an “extension”. The words were in agreement with the author’s philosophy; the thought of a neck extending out of the shoulders and elongating eventually the back muscles. This terminology was incorrect and in fact in contradiction with the horse’s actual physiology. The lowering of the neck is not an extension but rather a flexion created by concentric contraction of the lower neck muscles. The total elevation of the neck promoted by the Prussian cavalry was indeed an extension. Licart’s philosophy remains the idea behind the lowering of the neck, an elongation that stretches the upper neck muscles and sub-consequently the long back muscles. If we give credit to this theory, we must first verify if the muscles situated below the cervical vertebrae (ventral muscles) are capable to elongate the muscles situated above the cervical vertebrae (dorsal muscles). Then, we should ensure that the lowering of the cervical vertebrae effectively stretches the long back muscles connected to the cervical linkage. A distinction needs to be made between “elongation” and “stretching”. The words are synonyms but their nuances are important. One elevating the arms vertically above the head does elongate the back muscles but does not really stretch these muscles. Suspended by the hands to a horizontal pool, one will have the same posture but one’s body weight will add a force that will elongate further the back muscles. This effort is more precisely described as stretching. As the neck becomes longer, the attraction of gravity become greater. The main task of the upper neck muscles is then to carry the head resisting gravity forces. Oops! You need a forklift! The renowned Pathologist James R. Rooney does not think that the ventral neck muscles are capable of stretching the muscles situated above the cervical vertebrae. The lowering of the neck is created by concentric contraction of the lower neck muscles. The lower muscles are aided in their task by the attraction of gravity. Such lowering is permitted by the elongation of the dorsal neck muscles. However, the dorsal neck muscles are also the muscles carrying the head. The horse’s head and neck weighs approximately 10% of the horse’s body mass. The Prussian cavalry’s basic idea was precisely to reduce the burden of the head and neck placing the head as close as possible from the vertical of the shoulders. As the neck becomes longer, the attraction of gravity become greater. The main task of the upper neck muscles is then to carry the head resisting gravity forces. As the neck lowers, the dorsal neck muscles elongate resisting the burden of the head and neck. When the neck is up, upper neck muscles are acting from the scapula and back resisting the burden of the head and neck (right side of the picture). As the neck lowers, the upper neck muscles elongate while resisting the weight of the head. The eccentric contraction occurs in the direction emphasized by the black arrow (left side of the picture). Stretching theories believe that while the neck is lowering dorsal neck muscles are working in the direction illustrated on the left side of this picture, pulling on the back muscles. If it was the case, one would need a forklift. “So why does the horse lower the neck after collected work”? The nuchal ligament extends from the dorsal spinous process of the fourth thoracic vertebrae to the back of the skull. Contrary to traditional beliefs, the nuchal ligament is not under tension when the neck is held in an alert posture, which is approximately an angle of 60º. Such angle is about the angle of the dressage horse’s neck posture. The neck is then fully supported by the work of the dorsal neck muscles. As the neck lowers, the nuchal ligament comes under tension. The nuchal ligament is then assisting the upper neck muscles. The backing provided by the nuchal ligament is considerable. At the walk for instance, measurements have demonstrated that the nuchal ligament was replacing 55% of the work of the dorsal neck muscles. 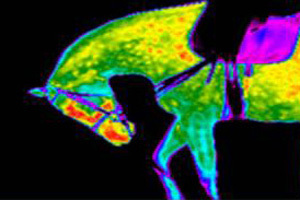 At the trot and canter, where the neck is submitted to lesser movements, the work of the nuchal ligament reduced the work of the upper neck muscles by a percentage of 32 to 36%. For simplification, diagrams always represent the whole structure of the nuchal ligament as clean bungee cords. On the diagram that was presented at the top of the page, the funicular element is represented in red and the lamellar elements are represented in orange. In reality, the lamellar part of the nuchal ligament is very broad. The broad lamellar part helps to understand how the nuchal ligament can provide such efficient assistance to the work of the upper neck muscles. After collection, the horse lowers the neck increasing the tension of the nuchal ligament and consequently reducing the work of the upper neck muscles. However, ease does not mean relaxation. Even if the nuchal ligament does a large percentage of the work, the dorsal neck muscles are working to carry the head against the attraction of gravity. The nuchal ligament comes under tension when the neck lowers below and angle of 60º. In the picture at left, the nuchal ligament is not under tension. On the angle and lower at the pictures at right the nuchal ligament is under tension. The tension increases as the neck becomes longer and lower. Each horse’s morphology is different and the comfort zone varies from one horse to the other. The comfort zone is the neck posture where the tension exerted on the nuchal ligament reduces the most efficiently the work of the dorsal neck muscles. “But it seems logical to me that the back muscles inserted on the cervical vertebrae stretch when the neck is lowered”. For simplification, the main back muscles often referred to as “longissimus dorsi”, are represented as long bungee cords stretching form the sacrum to the cervical vertebrae. In reality, longissimus dorsi is a generic term which includes the longissimus cervicis, thoracis, lumborum, etc. The muscles group is composed of two divisions each side of the spine. The dorsal division is illustrated on the following diagram with the upper red line. The ventral division is illustrated with the lower red line. Construction and functioning of the horse’s back muscular system does not support the theory of stretching. The thought is based on several simplistic views. First is the idea that the horse’s vertebral column is flexing and extending as a whole. Executing this move, the horse flexes the lumbar region and simultaneously extends the thoracic spine. The misinterpretation gravely compromises the horse’s ability to perform since at the contrary, the main function of the back muscles is precisely to prevent the vertebral column linkage from amplitude of movement exceeding its possible range of motion. The equestrian language will see the word “stiffening” as a defect. In the context the meaning is that during locomotion, the vertebral column muscles are stabilizing the spine and preventing excessive movements. The more intensively the stretching theories will try to increase the vertebral column’s range of motion, the more intensively the back muscles will resist such increase. “But I feel the horse relaxing when he is lowering the neck”! The nuchal ligament is another neck structure placed under strain when the neck is lowered and over-flexed. Since from the perspective of the upper neck muscles, the concept of stretching is a theory that does not really translate into reality, perhaps the “relaxation” that anyone can perceive when the neck is lowered results from the action of the nuchal ligament on the vertebrae of the thoracolumbar spine. did not gained mobility associated with the lowering of the neck. In all the five specimens the capacity of flexion diminished between T18 and L5 when the neck was lowered. “This diminution ranged from 0,1º to 0,9º in each intervertebral joint.” (Denoix, 1999). The average amount of flexion in the lumbo-sacral area was greater when the neck was lowered. In the cranial thoracic area, intervertebral movements are greater between T6 and T10 when the neck is lowered Set in mirror image direction, there is another muscle group often referred to as spinaleus dorsi. This muscle group includes the multifidius and other muscles. The fascicles of this muscle group are oriented oblique, down, and backward. They are illustrated in green on this picture. This is the best biomechanic explenation I have ever found and that also might be understood by the practical rider. Very interesting article. A must read.